FIRST: please leave a comment if HeroPress has inspired or impacted you this year. I’ve love for you to be a part of this post. With that out of the way, another year of HeroPress has come and gone. HeroPress is still young enough that we can’t really see multi-year trends, but I still find it interesting to look at them and try to guess things. In this post we’ll look at some stats, some things I tried that didn’t work, some things that did work, and some dreams for the future. Diversity has always been important to me. In 2015 and 2016 I had more men than women, by a pretty wide margin, and that bothered me. In 2017 I’m happy to say we had 32 women and 21 men. I didn’t work SUPER hard at that, it was just something I kind of kept in my head when I was looking for new folks. We also had great geographical diversity in our contributors, representing 27 different countries. The US and India had far more than any other country, which has been the trend since we started, but the US has far fewer in 2017 than 2016. 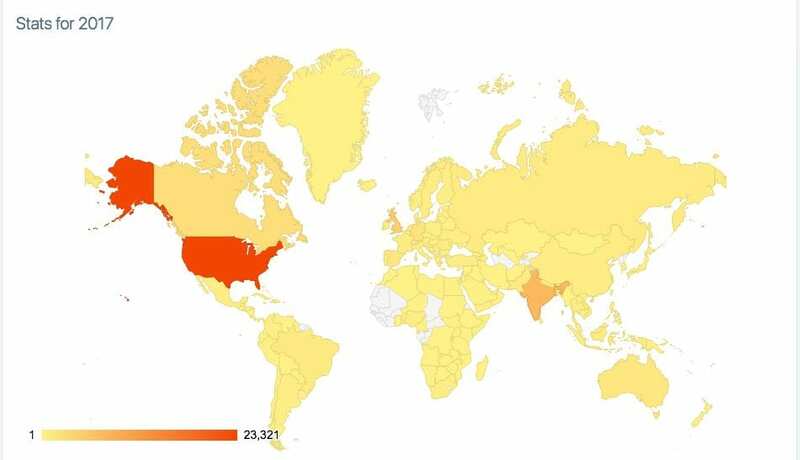 We had traffic from 175 countries this year. That said, HeroPress saw less traffic overall in 2017 than in 2016. Topher: Because he gets to see them all, AND behind the scenes. It’s heady stuff. Contributors themselves: MANY people have told me that writing their story changed their life. The simple act of processing things from the past, and getting them out there, and being vulnerable is powerful. Readers: Lot’s of people tell me it’s inspiring. What we learn from the above information is that HeroPress would be a success if we had zero readers. 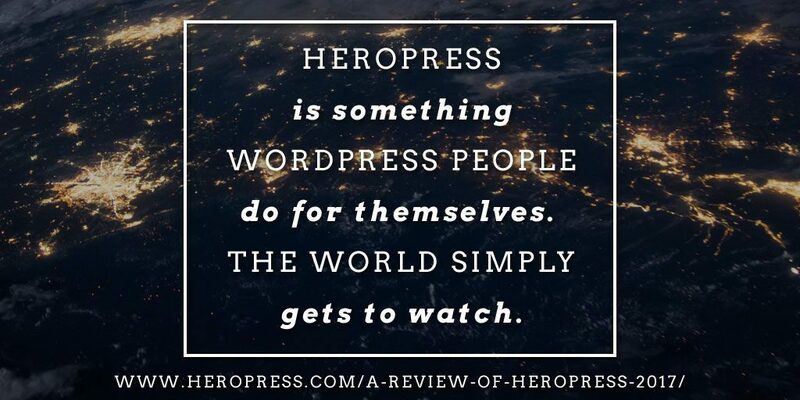 HeroPress is something WordPress people do for themselves. The world simply gets to watch. Last spring the folks from WPShout approached me about working together to offer a scholarship. They would offer the actual scholarship, and we would manage getting applicants and deciding who won. It was a huge success. We had tons of traffic, many great applicants, and the winners did great things with their scholarships. We’d love to do something like that again, so if you’re interested, drop us a note. This changed a bit in 2017. Most of the year was sponsored by Gravity Forms, which was great. That ended with only a few weeks left in the year, and I was surprised to find that there were a number of organizations that were interested in sponsoring a single week. That worked quite well, and I’m interested in looking into that more. At WordCamp US I spoke to an organization that was interested in sponsoring an entire quarter, which would be a first. It hasn’t happened yet, but I’m also looking into that some more. This didn’t really work out. I put up the donation form at the request of a few people that wanted to give. Those people gave, and a few more, but after the third day or so there were no more. There could be many reasons, but I’m not too concerned. I’ll probably take the form down, and if I ask for donations again it’ll be a Public Radio style press-a-thon for a week or something. Lots of flash, and then it’s gone for a year. As always happens, I got some great advice this year and lots of donated services and software. Many thanks to Tine Haugen from XWP for her ongoing input from a Larger Company perspective. Thanks to Pagely for hosting HeroPress. Thanks to our contributors. Without people willing to share of themselves, tell us their stories, make themselves vulnerable, HeroPress would not exist. Thank you SO SO much, all of you who’ve written. As I mentioned at the top of the post, the rest of the post is to be written by you. How has HeroPress impacted you this year? What value is there besides numbers and charts and graphs? The post A Review Of HeroPress in 2017 appeared first on HeroPress.